“Snow-Wreathed Fir” Tree Pin. $325. A snow-wreathed fir stands strong in the blue of a winter’s twilight. Wings summons the spirits of tree and storm in this diminutive pin, a tree for the holidays adance beneath the falling flakes. Cut freehand from sterling silver, the little fir’s boughs are garlanded with chased symbols of a sun setting beneath the clouds. Flowering snowflakes are scattered across its branches, three hand-stamped and two formed of overlaid conchas, tiny repoussé sterling silver starbursts fanned out in crystalline form. In winter holiday tradition, a hand-stamped star twinkles from the treetop. 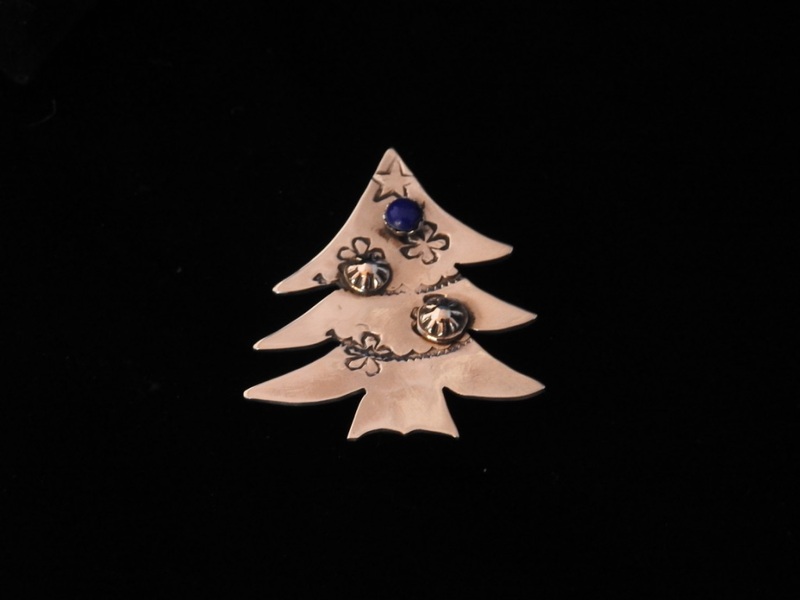 Tree stands 1-1/2″ high by 1-3/8″ across at the widest point; cabochon is 1/8″ across (dimensions approximate). Posted on Sunday, December 16th, 2018 at 6:39 pm. Filed under: Pins	RSS 2.0 feed.